What is Your Address If You Live on a Boat? Home > Ask Our Experts > What is Your Address If You Live on a Boat? I am new to this, so if you can bear with me! I was wondering, if you live full time on a canal boat how do you pay for your waterway licence as you don't have an address only a mooring? Organisations like banks and HMRC also need an address for communications, sorry if it seems a daft question. Also do you pay council tax if you live on a boat? I am guessing that you'd still be using some of the local authority services like refuse sites, emergency services and so on. The question of how you can receive post as a liveaboard is common concern for those considering life on the water. Fortunately living on board a canal boat doesn’t mean sacrificing your vital postal link to dry land. The options available in establishing an address and receiving post are largely dependent on the type of mooring you have. Generally this divides into two main categories; whether you have a permanent residential mooring or class yourself as a ‘continuous cruiser’, which means you are always on the move, never staying in one location for very long. Naturally, the postal needs of liveaboards with a fixed location are much easier to accommodate. Aside from basic facilities such as gas, sewerage and electricity, the cost of keeping residential mooring will typically entitle residents to that other essential requirement of modern living – an address. Residential moorings will usually allow post to be sent under the resident’s name to their main office, where it can be picked up. Some might even offer their tenants their own post box beside their vessel. One way of finding out if your mooring is officially recognised as a permanent address is to consult the electoral role. If it isn’t listed then you could have it added. The subject of maintaining a postal address only really becomes more complicated when you don’t have a residential mooring, and live the more nomadic lifestyle of the continuous cruiser. As they are not allowed to stay in one spot for more than 14 days – according to the British Waterways guidelines – and must keep moving on down the waterways, this naturally makes maintaining a postal address difficult. The main options open are to rent your own ‘PO Box’ or use an accommodation address service. Companies operate accommodation address services whereby they receive your post and forward it on to any address that you supply them with. Such an address could, for instance, be a local post office in an area you are travelling through. Of course using the address of a temporary post facility may be frowned upon by a bank or for use on legal documentation such as a passport or driving licence for example. One other solution that would get round this problem would be to use the address of a friend or family member. Although continuous cruisers face a bigger headache keeping track of their mail, they do at least have the upper hand where council tax is concerned. In having no official residence they are not liable for council tax. The official word is that they should pay if their boat is their main residence, but in practice only boaters with a permanent mooring – and a permanent address – are expected to pay up. Currently they are within Band A, the lowest band. Moorings Business: Do I Need a Licence to Live There Permanently? How Can I Keep My Boat in Water During Winter? Importing a Boat, What Are the Duties Etc? Solar and Wind Power - Are There Limitations? I'm applying for fiancè visa to settle in the UK. My fiancè is from the UK and he has been living in a boat for 3 years. Part of the visa application is that we must provide for proof of adequate accomodation. My fiancè is the owner of the boat but will get the manager of the Marina to write an official letter to show that my fiancè has been living in the marina for sometime and is the boat owner. My fiancè does not pay council tax and i don't know whether he should or not. I need to know if not paying council tax could be a problem and could it affect the visa application? This is totally wrong. There is the continuous cruiser, A general mooring in a marina, or boat yard . Or a residential mooring. Residential moorings are as rare as hens teeth. To turn a general mooring into a residential mooring you first need the permission of the canal and river trust. if they say OK then you employ a solicitor who writs to all the local residence in the neighborhood if they say OK then you can ask the PO for a post box.It can take years and years.And costs a lot of money. Residential mooring means you are then a house so pay council tax. No you cant have a PO Box at the post office in order to do that you need a permanent address in the first place. I am thinking of g8ving up my council flat and living on a house boat soon. How many months can i live on a house boat in a maria before i am liable for council tax. Also do the marina owners give everyone name to local council tax even if your not living permanently. I will be living on a canal barge indefinitely, my concern is that of my personal independence payment and my employment and support allowance, can i use a post office as an address for them? My husband and I are selling our house so we can live full time on our boat.What address do we give to car insurance and DVLA?Can this be a POBox?Similarly,updating bank account details no passport?Thanks. @Griff - if you are constantly afloat and moving on it is tricky, you have to plan ahead with PO boxes. Or ask a friend or relative to check and forward you the post. Most things are done online now, you may be able to switch most things across and go paperless. hello, I live aboard my canal boat, but I am planning to retire onto a sea-going sail boat. how would i keep an address? @ It doesn't affect your council tax but you still have to be careful especially if she's a person whose inclined to rack up debts (you never can be too careful). Why doesn't she set up a PO Box? 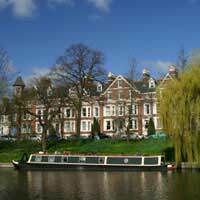 You may have to pay council tax if you live on a houseboat with a residential mooring, please see link here. Hi my husband has just told me that I have to have a postal address so that I can pay council tax as we are living in a marina on a leisure mooring is that right ? Re: Do I Need a Licence To Live on a Boat? Re: What is Your Address If You Live on a Boat?